Top Ten Bloggers And Blogs In Nigeria 2015. 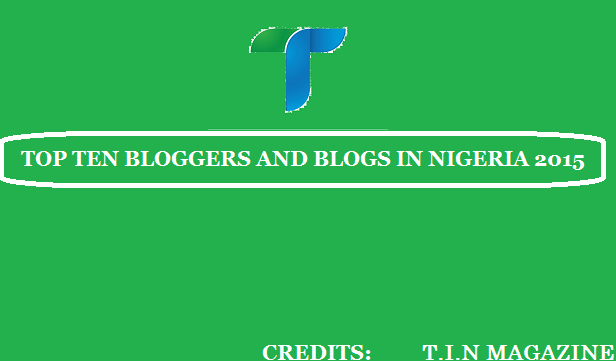 T.I.N Magazine just rated the top ten bloggers and blogs in Nigeria as of 2015 using different criteria. As we all know blogging in Nigeria at the moment is one of the most indulged in activities on the internet, its been noticed there are are thousands of blogs and bloggers in Nigeria today but this ratings would show you the ones at the top. The list was rated with the level of popularity a blogger has and the level of traffic the blog gets. Find the properly rated list below. Jide Onasanya is the founder of the popular tech blog “ogbongeblog.com”, the blog is arguably the first successful technology blog in Nigeria and the most popular today. Jide originally studied biology at the University, but his creative and writing instincts pushed him into blogging. Jide Ogunsanya is well respected among his fellow bloggers in Nigeria and this creates a lot of speaking gigs for the brilliant entrepreneur. He’s been rated no.10 on this list. Misspetitenaijablog.com is an entertainment blog owned by female writer and blogger Emeh Achanga, the blog is not generally popular but you should know misspetite gets her visitors in hundreds of thousand per week, she is quite a top blogger in Nigeria presently, she is not socially famous but her blog readers love and know her well..following alexa stats she is one of the most visited blogs in Nigeria this year. She’s rated no.9 on this list. Ladunliadinews.com, though this blog and owner might sound so strange because you might not have heard about the blog before, this is another female owned entertainment blog where various kind of news are being posted, Oladuni is said to be quite more into politics and normal Nigerian news. She’s been doing the job for years and she is quite experienced at it. She gets hundreds of thousand visitors visitors per week and she is quite known by many people at the top. She recently signed an endorsement deal with Skye Bank. According to stats calculated by T.I.N her blog is among the most visited blog-site this year. She’s been rated no 8 on this list. lailasblog.com is yet another Nigerian entertainment blog owned by a female Nigerian banker and writer. Laila is a bit of popular a blogger in Nigeria at the moment as her blog’s traffic keeps increasing massively every year. She does the same thing her other mates do; Nigerian news and gossips. She says she is a banker and yet she has all the time for her blog and her readers. She is also a married young woman with kids. Following traffic reports Laila is among the most visited blogs in Nigeria this year. Stella is a foreign based popular Nigerian blogger, she used to be a staff of Econium magazine in lagos, Stella Doesn’t just blog about entertainment alone, she blogs everything that makes her blog readers happy, we actually can say her blogging niche is “diversified” as she includes comedy,inspirational stories and more… Stella was already known by a few even before she started blogging. She is out of Nigeria but still making her money off Nigerians.. Stella is known to be married with kids and based in Germany. whoever cared to listen or read. music acts as well as the labels that represent them. Notjustok.com is the most visited and popular music blog in Nigeria presently. Rated no. 9 on this list. Naijaloaded.com.ng was once a forum but a couple of bad experiences with hackers led to the decision to convert the forum which had amassed over one million users in such a short period of time into a blog Makinde Azeez is the man behind the blog who is not well known by many. Noble Igwe is the founder of 360nobs.com, an entertainment and lifestyle website. Noble Igwe once said; where others see “showbiz”, I see “showBIZ”. 360nobs.com is a home for entertainment and lifestyle news. Most successful bloggers try to diversify into other things e.g. public speaking, acting, endorsements and many more, after successful setting up and monetizing their blogs. Noble has generally avoided public speaking but has added other business units, 360Delivery and some others, 360Delivery is not your regular courier service, they can get you roasted plantain if that is what you want, beat that DHL). Rated no.3 in Nigeria for this year. Uche started BellaNaija at a tender age of 25 and she has been able to achieve great things with her incredible leadership and commitment. Bellanaija can be said to be the first real entertainment site in Nigeria before others started popping up. It is much more regarded as an online portal with a lot of matured contents. As we all already know Linda is going to be the number one on the list so here it is. She started blogging fully in 2007 to share things that she was interested in with her readers. 8 years later, lindaikeji”s blog has grown to be one of the most visited sites in the country. As a regular source for news, entertainment, celebrity gist, gossip and many more, her blog continues to attract thousands of visitors. Linda Ikeji has earned herself the title ‘Nigeria’s Queen of Blogging’ . Linda Ikeji has grown from a blogger who covers celebrity stories to a celebrity-blogger. She’s been rated to be Nigeria’s no.1 Blog and Blogger of the year 2015. NOTE: The list is no one’s opinion, it was properly rated by T.I.N Magazine using the right criteria and statistics. This is not an all time ratings its for 2015 and 2015 alone next year’s rating might be different.